Here is a great deal on the LG HG2 series 18650’s. These are the upgrade to the red HE2 series. The upgrade is about an extra 800mAh but the amp level stays the same. For $20.99 you get a 4 pack + a case which is a hell of a deal! 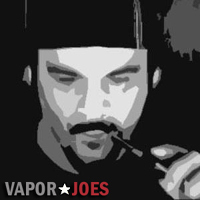 Including Aspire, Kanger, Smok, Eleaf, Coil Art, and more! 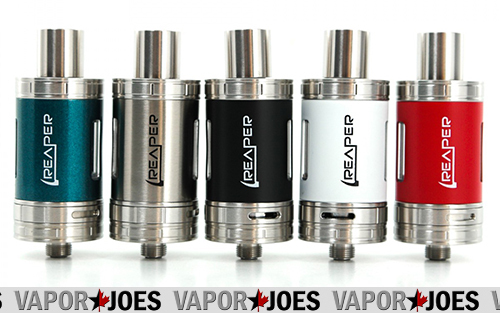 Here is a great deal on a RDA RTA rebuilding kit. 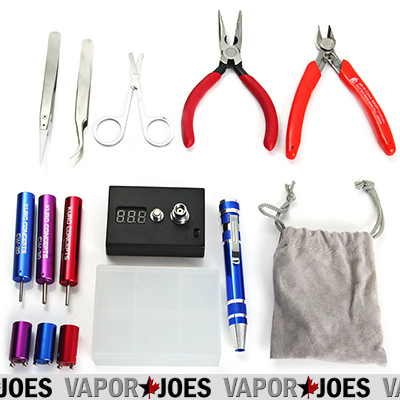 It comes with everything you need to make the perfect coil. Each pack also includes a carrying case and ohm meter. THE CHEAPEST PRICE IN THE INDUSTRY WITH SHIPPING FROM THE USA! Vaporesso Tarot 200 VTC Mod is an incredibly small dual battery box mod. Don’t let the size fool you, the Vaporesso Tarot 200 VTC packs quite a punch. The Vaporesso Tarot 200 VTC can fire up to 200 watts and supports Ni (Nickel), Ti (Titanium), and SS316 (Stainless Steel) wire in temperature control mode. The Vaporesso Tarot 200 VTC feels quite comfortable in your hand due to the lightweight zinc and aluminum alloy construction. It also features a smooth carbon fiber finish which feels and looks great. The Vaporesso Tarot is also available in four gorgeous colors such as black, white, orange and blue. The Horizon Arctic V12 Sub-Ohm Tank presents itself as the performance frontrunner in the new and highly competitive large form factor Sub-Ohm Tank segment, packing in the incredible Arctic V12 twelve coil structure with triple 11mm by 5mm airslots that combine for near unprecedented performance capabilities. Measuring 25.5mm in diameter, the Arctic V12 follows the classic Arctic design language and aesthetic, and is manufactured out of high grade Stainless Steel and glass. 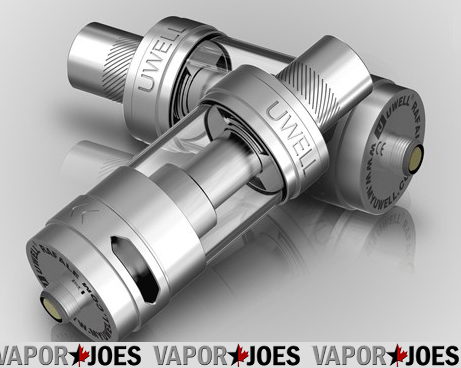 Each kit includes both of the new V12 coil structures, each packing in a four chamber, vertical coil orientation design. Each chamber features a triple coil configuration, resulting in an unmatched twelve coil total loadout. Each chamber is wicked by a large 8mm by 3mm wicking slot, allowing for fast and effective wicking even at the 0.1 ohm’s 180W maximum. Also included is a full sized 18mm build deck diameter V12 RBA Base, featuring a two post design with each terminal measuring 2mm by 4mm. Dual unified wicking wells and dual 7mm by 3.5mm internal airslots allow the V12 RBA Base to compete with flagship level RTA decks, giving the Arctic V12 a huge range of versatility. The Arctic V12 also packs in a massive 5ml tank capacity, filled with a traditional threaded top fill section, and is a rarity in the large form factor segment by featuring a standard 510 drip tip port, allowing it to be used with a huge range of drip tips. Built to compete with the largest and most performance orientated Sub-Ohm Tank platforms in the market, Horizon’s Arctic V12 combines a elegant, efficient chassis with class leading performance. Vaporkings was the site that sold me my first kit many years ago. They have a bunch of different name brand 30ML bottles for just $10.00. Even brands like Five Pawns. That’s a deal I can get behind! This is a beast of a mod at a crazy price! The iJoy Maxo 315W TC Box Mod enters the market as one of the most powerful devices available with a maximum output of 315W, powered by four 18650 batteries that can provide near unmatched battery life. Featuring an astounding 5 to 315W output range and a 1 to 50A output, the Maxo leads the category in power capability and flexibility, with an additional four setting output allowing for more customization options. Full temperature control suite features support for Ni200 Nickel, Titanium, and Stainless Steel heating elements alongside adjustable initial resistance. Temperature output ranges from 300 to 600 degrees, with a atomizer resistance range of 0.06 to 3.0 ohms for all outputs. The Maxo allows for an incredible battery capacity of four 18650 high amperage batteries that allow for unprecedented range and effective output, with the capability to be run with only two batteries if needed. Each battery is loaded from the sliding and locking battery access door located at the base of the device. The Maxo features a 0.95 inch OLED screen with a three column arrangement that neatly organizes and displays essential data. Built to be the utmost leader in performance and battery life, iJoy’s Maxo 315W TC is a no holds barred flagship device intended for enthusiast level use. USE COUPON CODE VAPORJOE13 TO GET THESE PRICES! 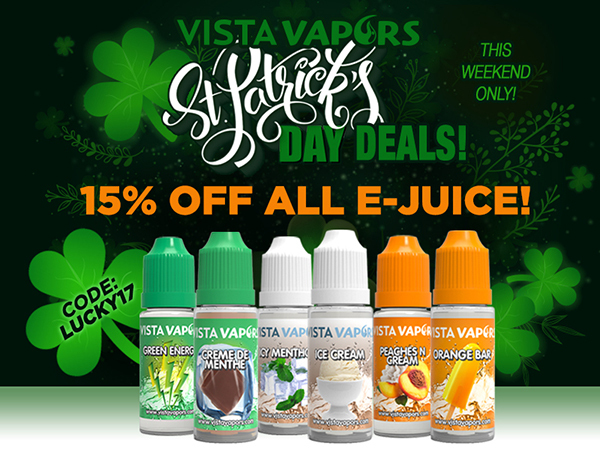 Right now Fuggin Vapor is doing a single bottle of their liquid for $12.00 for St. Patrick’s Day. For those that didn’t want to commit to the higher priced deals can now try them at a very reasonable price. 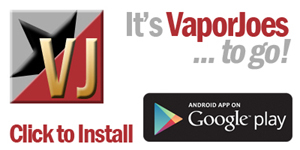 If you love sweet vapes your going to love Fuggin Vapor. 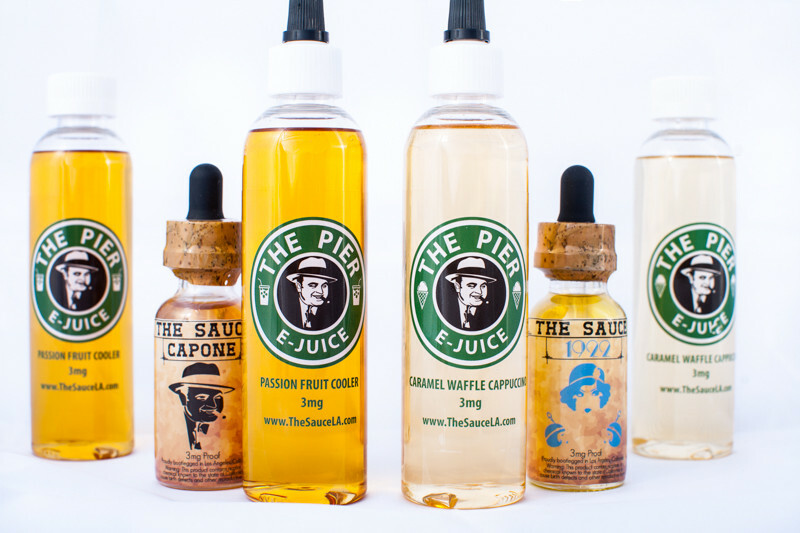 VIsta Vapers sells some good juice. They remind me a lot of Mtbakervapor but a little better. Right now they are running a 15% sale on already REALLY low juice prices. You getting a killer deal. I just bought 107ml of a custom flavor — Black Licorice, Orange, and Grape. USE COUPON CODE LUCKY17 TO TAKE 15% OFF YOUR TOTAL ORDER.